During a recent fish fauna study of the Seyhan Reservoir (Adana, Turkey) between March and May 2008, several specimens of Palaemonetes antennarius (H. Milne-Edwards, 1837) were collected by fish net and fish stomach content. This is a new locality for the grass shrimp, P. antennarius in Turkish inland water system. The caridean prawn genus Palaemonetes oc-cupies a wide variety of habitats from marine conditions to freshwater (Guerao, 1993). Palae-monetes antennarius (H. Milne-Edwards, 1837) distribution in the fresh waters (lakes and rivers) and sometimes in coastal brackish water lagoons and estuaries in France, Italy, Spain, Slovenia, Croatia, Greece, Turkey and Syria (Mediterrane-an Basin) (Holthuis, 1961; d’Udekem d’Acoz, 1999; Falciai and Palmerini, 2002; Gottstein Ma-točec and Kerovec, 2002). The grass shrimp, P. antennarius have been previously reported for the first time by the Hol-thuis (1961) from the Bileybi Antalya (estuary of the Boga river, 0-10 altitude, 18 April 1959) and Döşemealti lake, Antalya (Turkey) (300 altitude, 20 April 1959). Other previous records from Turkey were; Antalya, Topbağazı lake (Hatay) (Pretzmann, 1973), Kırkgöz Lake (Antalya) (Özbek and Ustaoğlu, 2005), Kırkgöz springs (Özbek and Ustaoğlu, 2005; Özbek et al. 2009), Göksu Creek, Aksu Creek (Özbek et al. 2009), Yuvarlakçay (Köyceğiz- Muğla) (Özbek et al. 2004), Bafa Lake (Geldiay et al. 1977) Bafa Lake and Demre Lagoons (Kocataş and Katağan, 1983) and Aegean Sea coast of Turkey (Ateş et al. 2004). To date, 4 species of fresh-water shrimps have been reported from Turkey inland system: P, an-tennarius; P. turcorum Holthuis, 1961, P. meso-potamicus Pesta, 1913 and Atyaephyra orientalis Bouvier, 1913 (Holthius, 1961; Özbek and Ustaoğlu, 2006; Alagoz Ergüden et al. 2011; Özcan et al. 2012). P. antennarius lives in brackish and fresh wa-ters of the Mediterranean area (Falciai and Palm-erini, 2002). Some of these habitats have large daily and P. antennarius inhabits stands of sub-merged macrophytes, finding refuge among their leaves during the day (Falciai and Palmerini, 2002; Ungherese et al. 2008). So far the species was not known to exist in the Seyhan River Basin. The present study re-ports the occurence of P. antennarius from the Seyhan River Basin which is also a new locality for the species distribution for inland water sys-tem of Turkey. The characteristics of this study area have been described by Alagöz Ergüden et al. (2011). The ecological study of fish fauna of the Seyhan reservoir (37°5′17″ N, 35°17′34″ E) was carried out from March to May 2008 (Figure 1). The specimens were preserved in 70% ethanol and deposited in the Museum of the Faculty of Fisheries, Mustafa Kemal University, İskende-run-Hatay (MSM) (Collection No: MSM-MALI/2011-04 (two speciemens) (Figure 2). In present study, a total of 4 P. antennarius specimens were collected from the Seyhan Res-ervoir between March and May 2008. The spec-imens of P. antennarius were collected between 0.5 and 15 m depth which is rich in aquatic vege-tation. The specimens were obtained by fish nets over muddy bottoms. The water temperature was measured as 26°C. Also, 16 specimens of P. an-tennarius were collected in the fish stomach con-tent (6 shrimp specimens in stomach two male specimens of trout; TL: 31.5-33 cm, W: 422.08- 457.77 g, Age: 2 and 3, and 10 shrimp specimens in stomach one male specimen of catfish; TL: 100 cm, W: 7.500 g and Age: 7). Alagöz Ergüden et al. (2011) reported Atyaephyra orientalis as a prey item of fish spe-cies [Silurus glanis Linnaeus, 1758; On-corhynchus mykiss (Walbaum, 1792)] in the same area. Aquatic invertebrates, crustaceans and mi-croalgae are the food source for Rainbow trout (Kara and Alp, 2005; Alagöz Ergüden et al. 2010). Arthropoda, diptera larvae, insects, small fish, zooplankton and on plant materials as a prey item for catfish (Schoonbee, 1969; Bruton, 1979; Yalçın et al. 2001). P. antennarius inhabits fresh (lakes and riv-ers) and brackish waters (Holthuis, 1961; Ude-kem d’Acoz, 1999; Falciai and Palmerini, 2002; Gottstein Matočec and Kerovec, 2002). 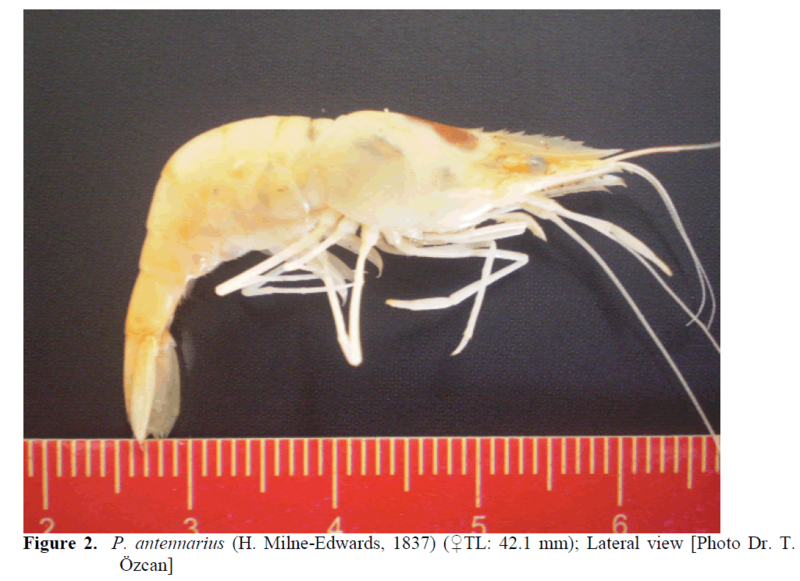 The grass shrimp P. antennarius is a benthic oligostenoha-line opportunistic omnivore decapod species (Matočec et al. 2006) and the species is very sen-sitive to environmental pollution (Bazzanti et al. 1997; Gottstein Matočec et al. 2006). According to Ungherese et al. (2008), P. antennarius inhab-its stands of submerged macrophytes, finding refuge among their leaves during the day. P. an-tennarius inhabits waters with pH higher than 8.0, temperature above 18 – 20 °C for at least 3 – 4 months (necessary for fixation of the eggs to the pleopods), specific concentration ranges of some ions (Na + , K + and Ca 2+ ) and optimum salinity of approximately 3-5 ‰ ( Parry, 1957; Parry and Potts, 1965; Dalla Via, 1986). The catfish, Silurus glanis Linnaeus, 1758; and rainbow trout, Oncorhynchus mykiss (Wal-baum, 1792) feeds on P. antennarius as a prey item. So far, P. antennarius has not been reported from the Seyhan river basin. Present study re-ports new locality and it was first reported in the Seyhan River Basin. AlagözErgüden, S., Güksu, M.Z.L., Çelikkol, Ç., (2010). Spring Feeding Habits by Escaped Cage Rainbow trout, Oncorhynchusmykiss(Walbaum, 1792) in the Seyhan Dam Lake (Adana/Turkey), Journal of Applied Biolog-ical Sciences, 4(3): 7-10. AlagözErgüden, S., Özcan, T., Ergüden, D., (2011). The Occurrence of Atyaephyradesmarestii(Millet, 1831) (Decapoda: Atyi-dae) in the Seyhan Reservoir (Seyhan River Basin), Journal of Black Sea/Mediterranean Environment, 17(1): 83-89. Ateş, A.S., Katağan, T., Kocataş, A., (2004). Türkiye’nin Ege Denizi Kıyıları Posidonia oceanica (L.) Delile, 1813 Çayırlarının Dekapod Krustase Faunası, Ege Üniversitesi Su Ürünleri Dergisi, 21(1-2): 39-42. Dalla Via, G.J., (1986). Ecological Zoogeography of Palaemonetesantennarius(Crustacea, Decapoda), Archives of Hydrobiologie, 106(2): 251-262. Gottstein Matočec, S., Kerovec, M., (2002). Atyaephyra desmaresti and Palaemonetes antennarius (Crustacea: Decapoda, Caridea) in the Delta of the Neretva River (Croatia), Biologia, Bratislava, 57: 181-189. Geldiay, R., Kocataş, A., Katağan, T., (1977). Bafa Gölü'nün Peracarida ve Eucarida (Crustacea, Malacostraca) Türleri Hakkında, Ege Üniversitesi Fen Fakültesi Dergisi Seri B, C.I, 4: 311-318. Holthuis, L.B. (1961). Report on the a Collection CrustacaeDecapoda and Stomatopoda from Turkey and Balkans, ZoologischeVerhande-lingen, 47: 1-67. Kara, C., Alp, A., (2005). Feeding Habits and Diet Composition of Brown Trout (Salmotrutta) in the Upper Streams of River Ceyhan and River Euphrates in Turkey, Turkish Journal of Veterinary and Animal Sciences, 29: 417-428. Kocataş, A., Katağan, T., (1983). Crustaceans Fauna of Turkish Coastal Lagoons, Rapport de la Commission Internationale pour l'Ex-ploration Scientifique de la Mer Méditerranée, 28(6): 231-233. Özbek, M., Balık, S., Ustaoğlu, M.R., (2004). Malacostraca (Crustacea) Fauna of Yuvarlakçay Stream (Köyceğiz- Muğla), Turkish Journal of Zoology, 28: 321-327. Özbek, M., Ustaoğlu, M.R., (2005). Taxonomical Investigation of Lake District Inland Waters Malacostraca (Crustacea-Arthropoda) Fauna, Ege Üniversitesi Su Ürünleri Dergisi, 22(3-4): 357-362. Özbek, M., Ustaoğlu, M.R., (2006). Check-List of Malacostraca (Crustacea) Species of Turkish Inland Waters, E. U. Journal of Fisheries & Aquatic Sciences, 23(1-2): 235-240. Özbek, M., Balık, S., Topkara, E.T., (2009). Con-tribution to the Knowledge on Distribution of Malacostraca (Crustacea) Species of Cen-tral and Southern Anatolia, With Some Eco-logical Notes, Turkish Journal of Zoology, 33(1): 47-55. Parry, G., (1957). Osmoregulation in Some Freshwater Prawn, Journal of Experimental Biology, 34: 417-423. Parry, G., Potts, W.T.W., (1965). Sodium Balance in the Freshwater Prawn, Palaemonetesantennarius, Journal of Experimental Biology, 42: 415-421. Pretzmann, G., (1973). ErgebnisseEiniger Sam-melreisenNachVorderasien 3. Teil: Garne-len und Krebse, Annalen des Naturhistori-schen Museums in Wien, 77: 331-333. Schoonbee, H.J., (1969). Notes on the Food Hab-its of Fish in Lake Barbespan. Western Transvaal, South Africa, Verhandlungen des InternationalenVereinLimnologie, 17: 689-701. UdekemD'acoz, C.D. (1999): Inventaire et Dis-tribution des CrustacésDécapodes de l'Atlantique Nord-Oriental, de la Méditerranée et des EauxContinentalesAdjacentes au Nord de 25°N [Inventory and Distribution of CrustaceaDecapoda in the Northeastern Atlantic Ocean, the Mediterranean Sea and Adjacent Continental Waters, North of 25°N], PatrimoinesNaturels(M.N.H.N./S.P.N. ), 40 : 1-383. Yalçın, Ş., Akyurt, I., Solak, K., (2001). Stomach Contents of the Catfish (Clarias gariepinus Burchell, 1822) in the Asi River (Turkey). Turkish Journal of Zoology 25(4): 461-468.